It’s been a while since I managed to download photos, especially food photos since I have to remind myself to take them in the first place. Unfortunately, once I cook, I’m so focused on actually EATING, that I never think to record things until we’re stuffing the empty plates into the sink. 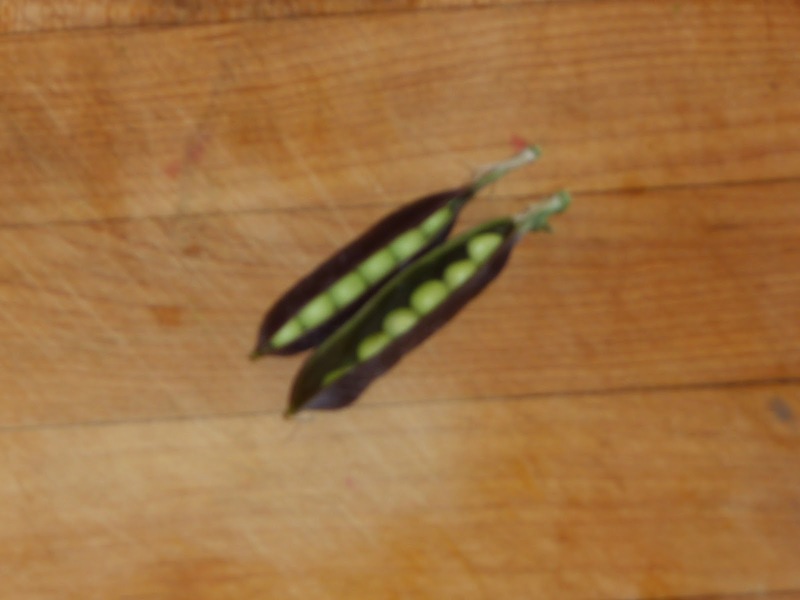 But I did manage to photo one plate of purple-podded shell peas from start to finish sometime in June. The rabbits had decimated my early-seeded veggies including the snow peas that I poked into the ground in about mid-April. I don’t mind tithing to the critters but I go ballistic when they only leave me a tenth or less! So before I put the purple-podded pea plants that I had started in the greenhouse into the ground, I set up camouflage in the form of row cover pinned to the trellis. 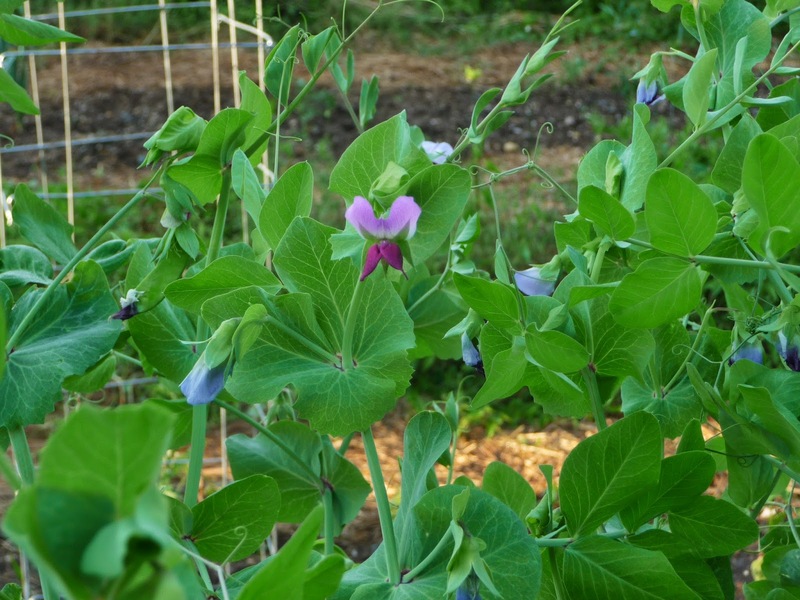 It worked; the rabbits by-passed them, and I ended up with beautiful vining peas covered in purple pods (also a fair number of green pods that apparently didn’t get the purple memo). At any rate, they were glorious, and I had several meals of peas done a couple of different ways. When they finally gave out, we clipped the vines at the ground and laid them behind the cabbages and purple kohlrabi that I had bought at Kingstown Farm Home and Garden. The kohlrabi had been marked ‘red cabbage,’ which appeared to be truth in advertising when it had only a couple of leaves on it. But instead of red cabbage it turned into beautiful purple globes that I turned into slaw and ate with fish tacos. (So much for warm red cabbage salad with garlic, toasted walnuts and feta, but the slaw was lovely). Pods opened (burry pic –sorry) but how pretty! 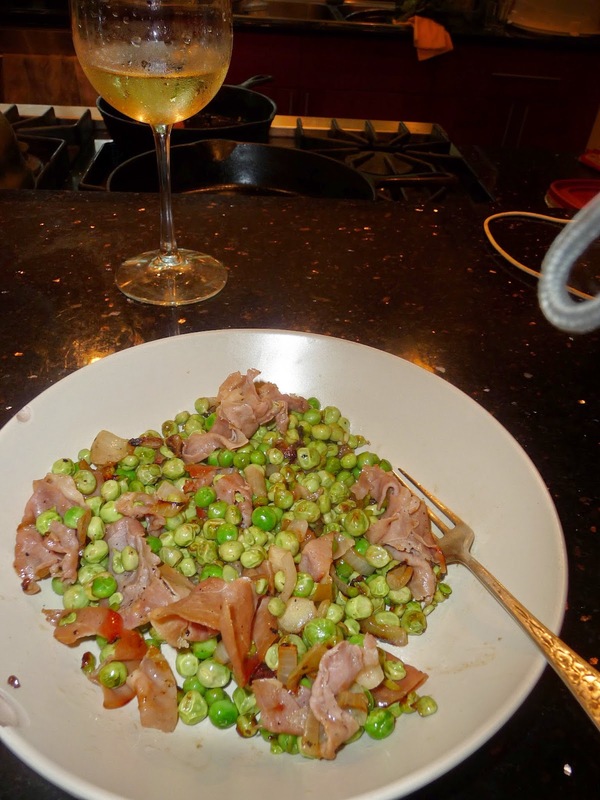 The peas, as I’m sure you suspect, are finished. We’re now picking haricots verts, herbs, the first Sungold cherry tomatoes (today! ), serranos and lemon peppers, but I’m still thinking ‘PEAS’ because it’s now time to put in a second planting of them. And bless my husband’s soul, he’s prepped a bed that I can stick them into in hopes of having more this fall. 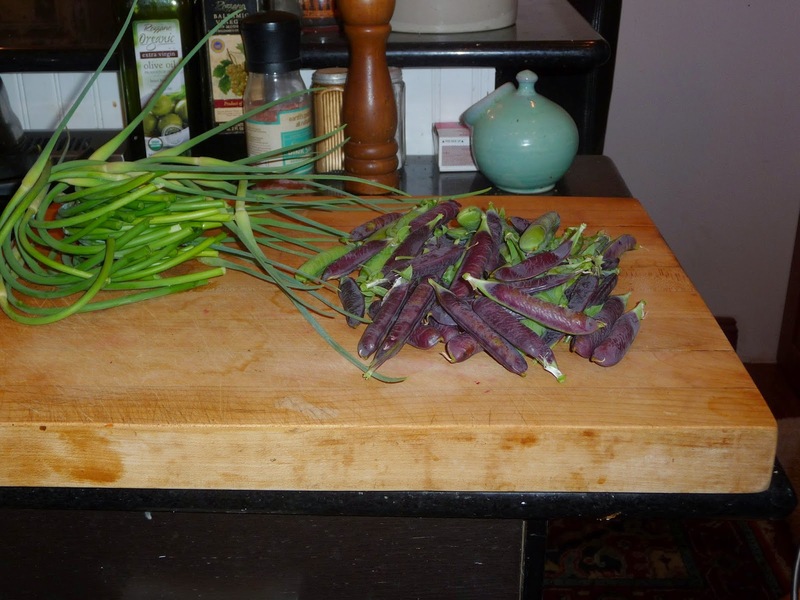 This year was the first that I tried the purple podded variety, and would do it again happily, though I’d make the trellis higher next time. Instead of 4.5 feet, they got to be about seven feet tall and drooped over the too-short support I had put up. Their flavor (always a critical point with me) is really good-sweet, not mealy or starchy if you get them before they swell the pods too much. They’re prolific, and because most of the pods are actually a burgundy-purple, they’re much easier to find and pick than the green pods we usually have.